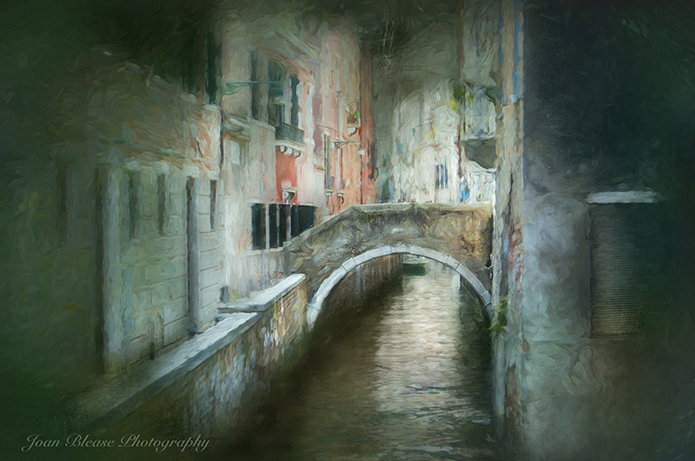 Today’s digital painting, this time the backstreets of Venice. Yes it started as a photograph and if it had stayed that way, I would suggest, it would have been as exactly the same as everyone else’s picture who stood in the same spot as I did. Some people get hot under the collar when someone “messes” with a photograph (it’s not proper photography) – but I applaud those who do – go for it, do more, push those boundaries ! This entry was posted in Blog, Digital Painting and tagged coral painter, creative images, Digital Art, Digital Painting, photography, Photoshop, photoshop manipulations, textures, venice. Bookmark the permalink. Certainly gives a more watery, atmospheric atmosphere. Like it. Another beautiful piece of work Joan.